Attention Home Owners and Business Owners with Septic System Problems! The Majority of Septic System Problems today can now be solved through new technology called Septic Remediation! "This process rejuvenates your existing septic system!" The reason that we can say this is because the majority of septic systems in the United States are conventional systems and the majority of the conventional systems failing (with the exception of systems in need of repairs), do so because of excessive bio-mat growth - about 99% of the time! "Field Line (Absorption Field) Problems - can develop due to the forming of excessive bio-mat growth. The bio-mat forms in the field lines where the anaerobic water makes contact with the aerobic soil. The majority of field line problems occur due to excessive bio-mat growth and this problem can be easily prevented by adding Air (aerobic bacteria) to your septic system which will reduce the bio-mat to natural levels." Bio-Mat growth problems can be easily remedied by installing a new device into your existing septic tank, which will remediate your entire system - so that it functions properly! If correctly installed and maintained, this process will ensure years of service. 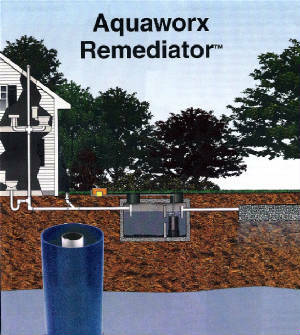 "The Aquaworx Remediator rejuvenates failing septic systems with minimal landscape disruption. This unique solution is inserted into an existing septic tank that is not performing properly and reverses the clogging process in as little as two weeks. The Aquaworx Remediator can rejuvenate any type of wastewater drain field and is a simple, permanent solution that requires minimal cost to operate and maintain. 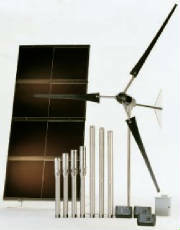 The Aquaworx Remediator is an airlift column. Cuspated plastic is wrapped around the bottom outside of the unit and placed within and above the bubble diffuser within the unit. The cuspated plastic provides a substantial surface area for colonization of the introduced bacteria. The Aquaworx Remediator aerates and circulates effluent within a septic tank for the express purpose of generating an active culture of the introduced bacteria. These bacteria create an aerobic environment within the unit and provide predictable disposal field remediation. The Aquaworx Remediator is not an Advanced Treatment unit and is certified by the Uniform Plumbing Code. The Aquaworx Remediator improves the performance of a biologically clogged failing septic system by enhancing the natural treatment process. The unit works by introducing oxygen and bacteria which work together to reverse the clogging process. Under normal operation, a septic system will build up a biological slime (biomat) inhibiting the soils natural ability to absorb water. A healthy population of oxygen rich bacteria consumes the slime that has built up over time. The Aquaworx Remediator creates an ideal environment for this process to take place. Oxygen is added to the system by a small air pump. The unit serves as a medium through which wastewater can circulate and come in contact with the oxygen rich bacteria. * Eliminates the need for a complete drain field replacement and the resulting landscape damage caused by heavy equipment. * Performance problems associated with a failing septic system such as odors and wet areas in the yard are eliminated in as little as two weeks. * Easy installation with no heavy equipment allows for minimal disruption and a quick return on investment. * Permanent solution that requires minimal cost to operate and maintain. Column diameter at top 12"
Column diameter at base 15"
Flow Rate 600 GPD / 4 bedroom house"
You can relieve some of the burden on your system by rerouting your gray water to include your washing machine, into a separate system. This will relieve the burden on the septic system by reducing the amount of water that it must process. Clothes Washers add a great deal of water to the system. Fact: Just one leaky toilet can back up a system so running your gray water into a separate system can help a great deal. Conservation can be achieved by utilizing Gray Water to flush your toilets rather than using potable (drinkable) water. Gray Water can also be used to water outside watering needs by collecting the water and then pumping it where most needed. Protecting your Investments with Gray Water: You can protect your landscaping investments from droughts by using a gray water system. For the best custom solutions - call Don Wolf (770) 692-0202. "We offer Do-It-Yourself Solutions like the Remediator "New in the Box" for only $2,500 and complex Professional Installations like the one below!" New Installation Photos "Click Here!"